November will soon be upon us. 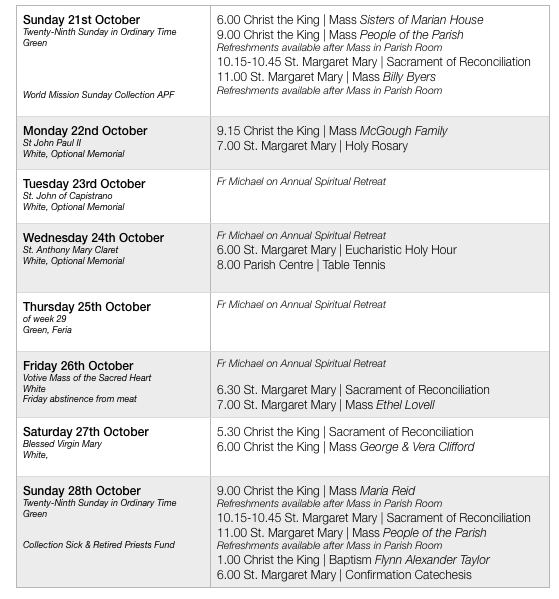 There will be a novena of Masses for the Holy Souls during the month of November. If you would like to include family members in this novena, please write their names on a piece of paper and place in the envelopes provided in both churches. It is a custom to include an offering with your intentions. 53+53+93  were at Mass last weekend. Thank you for your offertory contribution of £903.90. Voluntary Missionary Movement - £281.69. Aid to the Church in Need, a charity which assists persecuted Christians throughout the world, is encouraging us to ‘Go to Mass and Adoration for someone who can’t’ due to persecution. 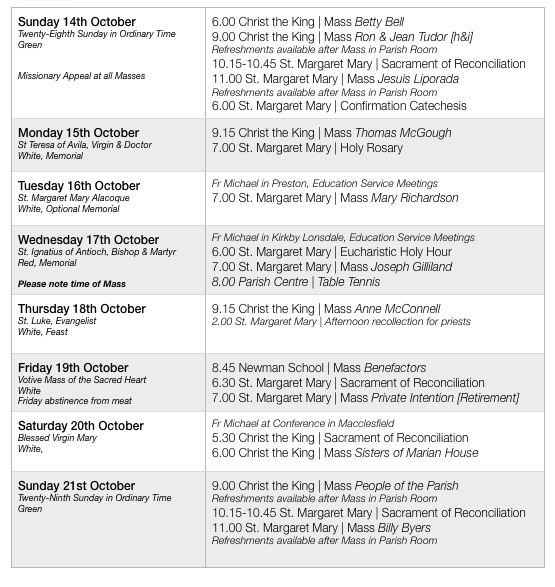 They ask you to consider coming to an extra Mass or attending Eucharistic Adoration during the week to pray for someone who, due to persecution, is unable to attend Mass or Adoration. Can you come to Mass or Adoration for someone who can’t? The Festival Choir continues on Sunday evening. We would love to have some new members to swell our ranks. You don't have to be musical and everyone can sing. Sessions are from 7.00 - 8.30 pm at Christ The King, young people would be especially welcome. Please give it some thought. HOST UK arranges for international students to enjoy brief home-stays with UK hosts, one day, a weekend or, over the festive period, a three day visit. We need more hosts so that a smile such as Marine’s can spread across many more faces…and across our fragile world. On Saturday, 17th November 2018 from 10.30 am - 1.00 pm in St. Bede’s Parish Centre, Wigton Road, Carlisle, CA2 7ES and led by Peter Cobb. The theme for the day will be based on hymns for the Eucharist relating to the recent National Eucharistic Congress. Fr Michael will be making his annual spiritual retreat this week. 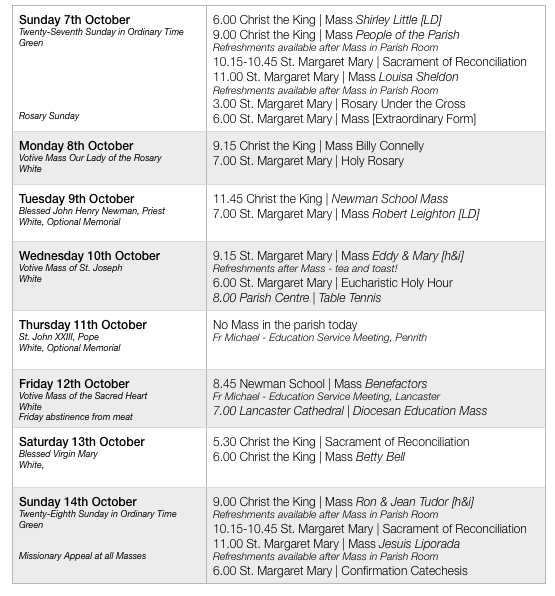 There will be no Mass in the parish Tuesday - Thursday this week. On Tuesday, 23rd October 2018, a Ten-Minute Rule Bill is being introduced into Parliament which seeks to decriminalise abortions that currently fall outside those permitted by the 1967 Act. First Holy Communion will be celebrated in the Parish on Sunday, 28th April 2019 [the Second Sunday of Easter]. Catechesis for candidates will begin on Thursday, 17th January 2019. Application forms are available in both churches for parents who would like their child to make their First Holy Communion next year. It is an essential aspect that children are brought regularly to Holy Mass each weekend and it is very sad that so few families have not continued to bring their children to Holy Mass after First Holy Communion this past year. Pray for them regularly please.